The Army Corps of Engineers announced on Sunday a decision that the Standing Rock Sioux Tribe and allied opponents of the Dakota Access Pipeline consider a major victory. The corps said that it would deny pipeline company Energy Transfer Partners the easement necessary for pipeline construction under the Missouri River. 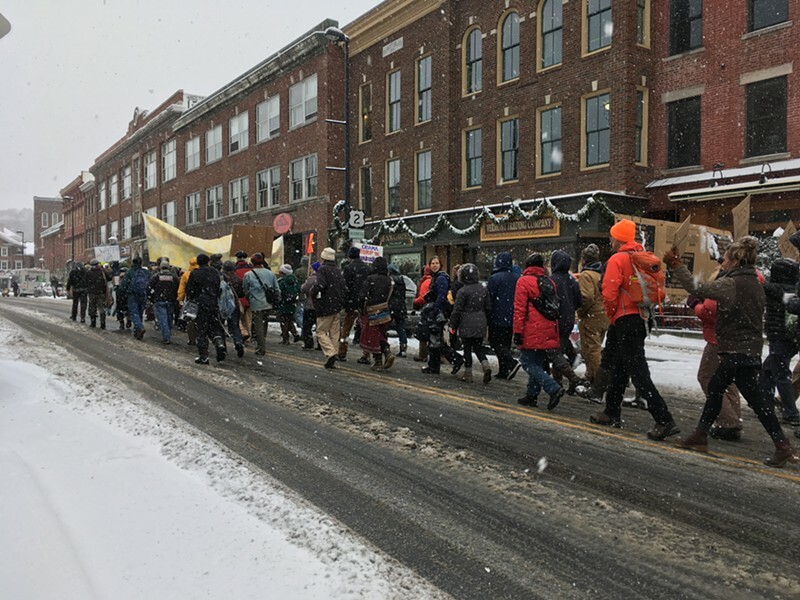 Despite that, more than 200 people marched in Montpelier Monday morning to show solidarity with DAPL opponents and to demand that TD Bank "withdraw its financial support from the DAPL." 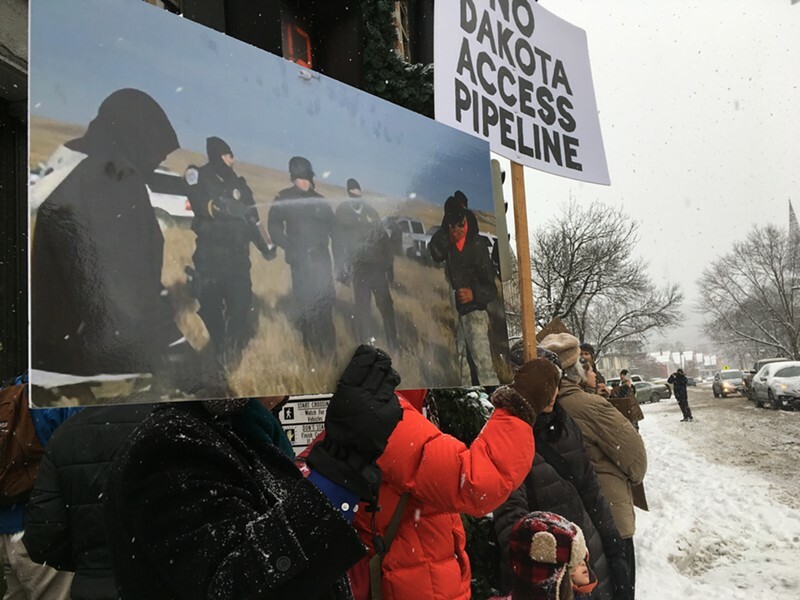 Organizers said that the action was a response to the Standing Rock Sioux Tribe's call for national and global shows of solidarity. 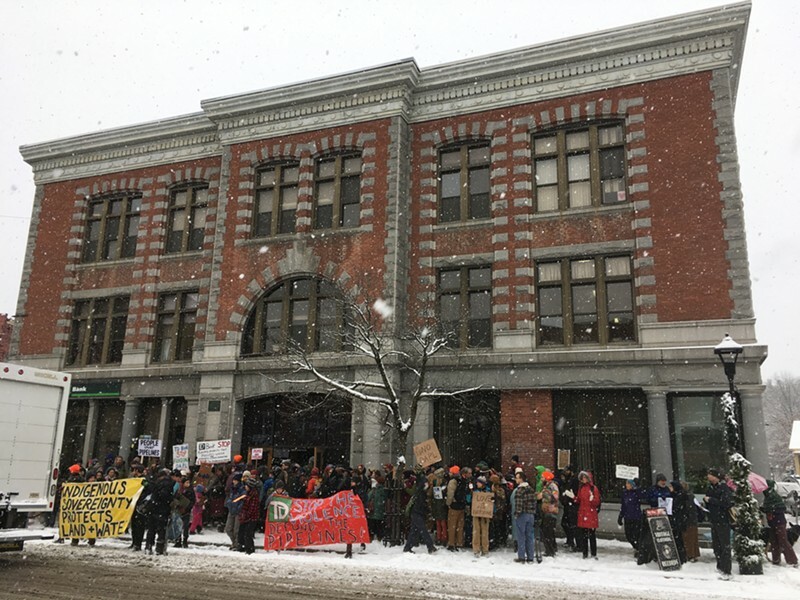 "It's an exciting and emotional victory, but I don't trust that this is over yet," said Anders Aughey, 26, a spokesperson for the central Vermont chapter of Showing Up for Racial Justice. 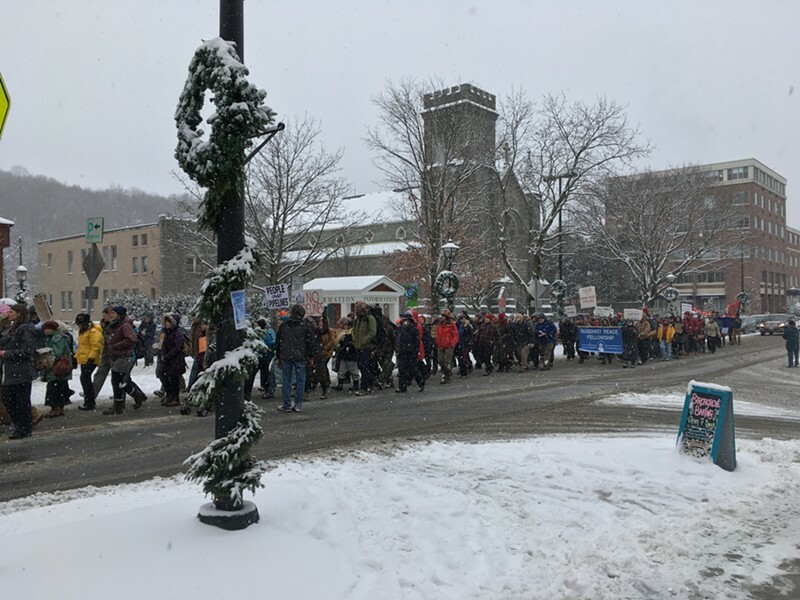 SURJ, Central Vermont Climate Action, the Upper Valley Affinity Group and others organized the action. Some participants, such as Erik Gillard, Henry Harris and Katrina Coravos, had recently returned from North Dakota camps. 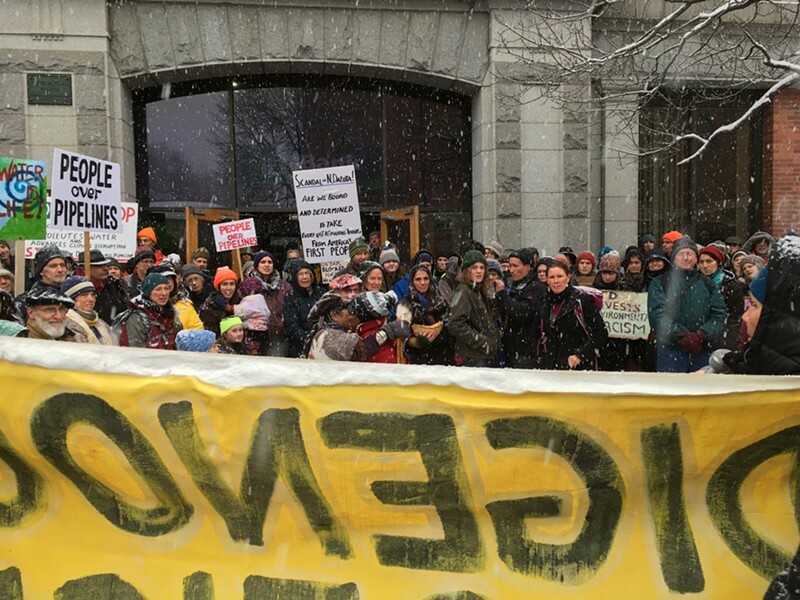 Gillard and Harris helped to organize the NoDAPL Builders Delegation and Supply Caravan, a group of approximately 50 volunteers who left Vermont and spent Thanksgiving week helping people who call themselves "water protectors" to winterize their shelters. People started gathering around 9 a.m. at Montpelier's Christ Church on State Street. A little after 11 a.m., they began their procession toward the TD Bank chapter a few blocks away at State and Main streets. Their tone was jovial and calm. Marchers carried banners declaring "Honor the Treaties," "Keep It In The Ground" and images of the earth. 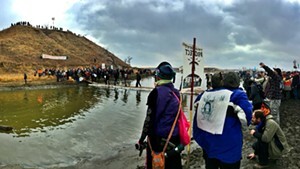 As they walked, they sang: "Remember the water; remember the land; remember the future; take a stand, take a stand, take a stand." 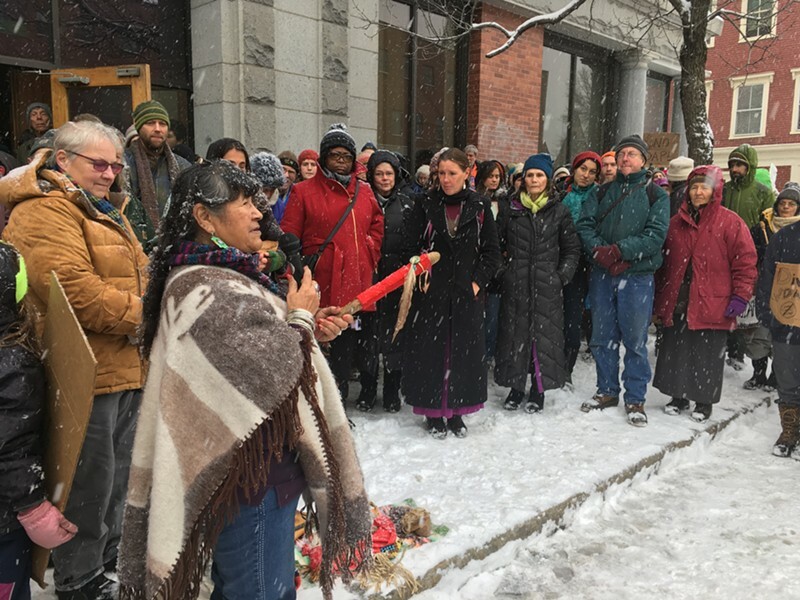 Among those leading the way was Beverly Little Thunder, a member of the Standing Rock Lakota Sioux and a Huntington resident who has lived in Vermont for 14 years. Little Thunder said she believes much work remains to ensure a pipeline defeat. "They are going to still try to get this pipeline through, so it's important that we look at who's supporting them," she said, referring, in this case, to TD Bank. Upon reaching the bank, a group of protesters — those willing to risk arrest — filed inside, and business was quickly suspended for the day. Most remained outside in the snow, forming a small circle on the sidewalk and spilling into the street. Beverly Little Thunder addresses the crowd. Catherine Cadden, an educator in nonviolence, led an opening call and response, shouting in Lakota, "Mni wiconi!" The crowd shouted back the English translation: "Water is life!" Cadden introduced Little Thunder. "It's through collective prayer that we're going to succeed in this world," Little Thunder said. She then performed a pipe ceremony, passing her "sacred people's pipe" to five other women, including Cadden, Coravos and Ebony Nyoni of Black Lives Matter VT. "This is not something that I generally do in public," Little Thunder said. "This is the season of transition," Nyoni told the crowd. "We are transitioning to another type of living — and it's about time." After Nyoni spoke, several area high school students read aloud a list of demands prepared by organizers. 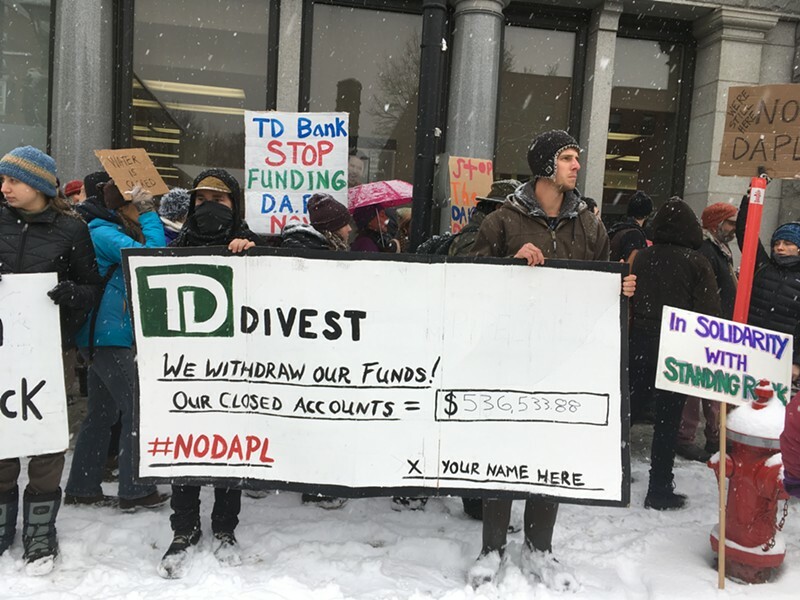 Among these was a call for TD Bank to withdraw funding from DAPL and the Vermont Gas Systems pipeline, and for the State of Vermont to remove its money from TD Bank. 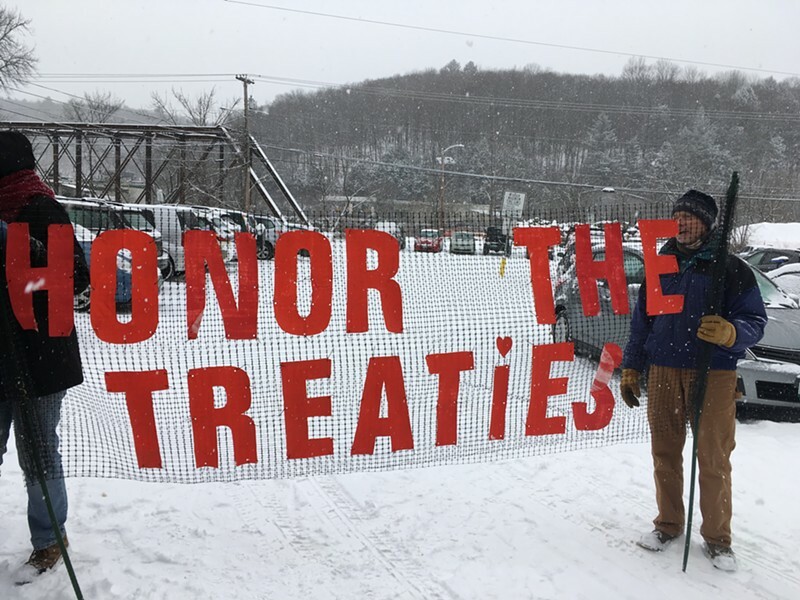 Coravos led a prayer and water ceremony in which marchers took a bowl of water from the Cannonball River in North Dakota and deposited it into the Winooski. On Sunday afternoon, Coravos had participated in a similar prayer ritual at Burlington's Main Street Landing Union Station, collaborating with local community members including Charlie Megeso, Laura Krouse and Fearn Lickfield, director of the Green Mountain Druid Order. Protestors hold signs on Main Street in Montpelier. Lickfield was in Montpelier, too. 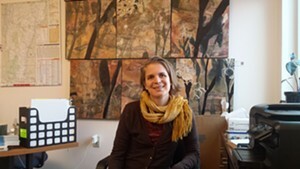 "My work is all about getting to the roots of the problem," she said. "And the roots of this problem are spiritual disconnect." Shortly after noon, some in the crowd went to a second TD Bank location at Main and School streets, where five people used PVC piping to lock themselves together to block drive-through banking traffic. At least eight people were arrested at the State and Main location, and the branch remained blocked by protestors and closed for the day. Those at the State and School Street location declared their intent to remain in formation until closing time at 5 p.m.
A bank representative at the State and Main location declined Seven Days' request for comment. Correction, December 8, 2016: An earlier version of this story misspelled Charlie Megeso's name.